Habit: Annual, biennial, perennial herb, taprooted. Stem: 1--several from base, erect, openly branched distally or +- throughout. Leaf: basal and cauline, alternate; proximal petioled, pinnately or ternately dissected into 3--many narrow [wide] segments; distal reduced, sessile. Inflorescence: heads radiate, discoid, or radiant in many-headed, +- flat-topped cyme-like clusters; peduncle slender; involucre obconic to hemispheric; phyllaries in 1--3 +- equal series, free; receptacle rounded, epaleate. Ray Flower: 0 or 10--21+; ray yellow. Disk Flower: 10--80+; corolla yellow or white to cream, sometimes purple-tinged; anther tips triangular; style tips narrowly or widely triangular. Fruit: club-shaped or obpyramidal, 4--5-angled, glabrous or +- hairy; pappus 0 or of (1--)10--15 generally bristle-tipped scales. Species In Genus: 11 species: southwestern United States, Mexico. Etymology: (Greek: membranous bristle, from pappus) Note: Species of Amauriopsis constitute a clade with Hymenothrix and are now treated here. Habit: Biennial, perennial herb <= 1.5 m. Stem: generally openly branched distally, glandular-hairy, at least distally. Leaf: densely crowded on proximal stem, dissected into segments generally <= 1 mm, glabrous or distal glandular hairy; margins rolled under. 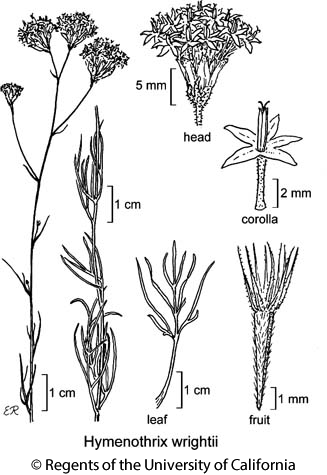 Inflorescence: heads discoid; peduncle 1--7 cm; bracts scattered, scale-like; involucre hemispheric; phyllaries 8--12, 3--8 mm, linear to oblanceolate or obovate, glabrous or glandular, tips obtuse, generally purple. Ray Flower: 0. Disk Flower: 10--30; corolla 5--8 mm, radial, white or purple-tinged, outer and inner +- equal, lobes linear, spreading; anthers +- 3 mm, dark purple. Fruit: 3--6 mm; pappus scales 3--7 mm. Chromosomes: 2n=24. Citation for this treatment: Bruce G. Baldwin & David J. Keil 2016, Hymenothrix wrightii, in Jepson Flora Project (eds.) Jepson eFlora, Revision 4, http://ucjeps.berkeley.edu/eflora/eflora_display.php?tid=3604, accessed on April 23, 2019.
s PR (Palomar, Cuyamaca, Laguna mtns); Markers link to CCH specimen records. Yellow markers indicate records that may provide evidence for eFlora range revision or may have georeferencing or identification issues. Purple markers indicate specimens collected from a garden, greenhouse, or other non-wild location.